The Centers for Disease Control and Prevention (CDC) has posted their final update on the investigation into the multistate outbreak of Shiga toxin-producing E. coli O157:H7 infections linked to beef products produced by Adams Farm. This outbreak appears to be over. 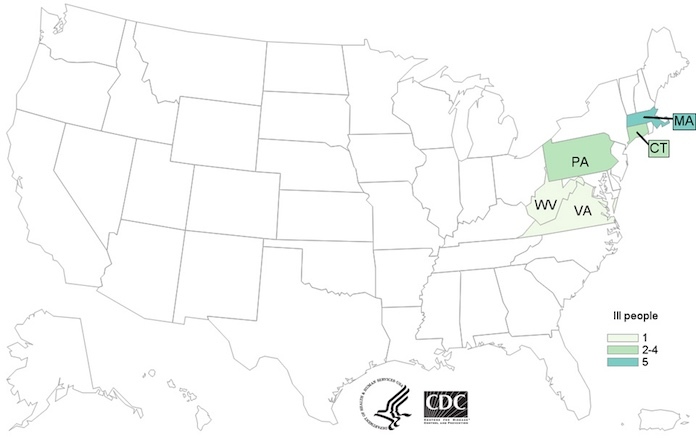 Eleven people were infected with the outbreak strain of STEC O157:H7 in five states. Seven of those people were hospitalized. One ill person developed hemolytic uremic syndrome (HUS), a type of kidney failure. No deaths were reported. The case count by state is: Connecticut (2), Massachusetts (5), Pennsylvania (2), Virginia (1), and West Virginia (1). Illness onset dates ranged from June 27, 2016 to September 10, 206. The patient age range was from 1 year to 74, with a median age of 32. Forty-five percent of ill persons were female. Epidemiologic, traceback, and laboratory evidence indicates that beef products produced by Adams Farm Slaughterhouse in Athol, Massachusetts, were the likely source of this outbreak. Seven of the seven people interviewed in this outbreak reported eating ground beef the week before they got sick. Traceback information found that six (86%) of those seven people ate ground beef produced by Adams Farm Slaughterhouse. The Connecticut Department of Public Health collected leftover Adams Farm Slaughterhouse ground beef from an ill persons home and from a restaurant for testing. They found the outbreak strain of STEC O157:H7 in both samples. The outbreak strain was defined by pulsed-field gel electrophoresis (PFGE) in this investigation. Adams Farm recalled various cuts of beef, veal, and bison products on September 24, 2016 for possible E. coli O157:H7 contamination. These products were shipped to farmers’ markets, retail locations, and restaurants in Massachusetts, Connecticut, and eastern New York, and may have been shipped to neighboring states. The products all have the establishment number “EST. 5497” inside the USDA mark of inspection. You can see the full list of recalled products at the USDA web site. Even though this outbreak is over, the recalled products may still be stored in home freezers. People who don’t know about this outbreak could eat them and get sick. Please check your freezer carefully to make sure you don’t have any of these products in your home. Don’t eat these recalled products, even if you plan to cook them thoroughly. Cross-contamination between the meat and other foods or work surfaces could still make someone sick. If you throw these products away, put them in a sealed bag in a secure trash can so that other people and animals can’t eat them. The symptoms of an E. coli infection include severe abdominal cramps, nausea, vomiting, and diarrhea that may be watery and/or bloody. Symptoms usually begin three to four days, up to ten days, from exposure to the bacteria. This infection can progress into hemolytic uremic syndrome in some patients, especially young children. The symptoms of HUS include little or no urine output, pale skin, a skin rash, easy bruising, lethargy, and bleeding from the nose or mouth. Anyone experiencing these symptoms should be taken to a doctor immediately. HUS can be life-threatening and can cause kidney failure, seizures, and coma. Contact the attorneys at Pritzker Hageman for help if you or a family member was sickened with an E. coli O157:H7 infection or HUS after eating recalled Adams Farm beef products.